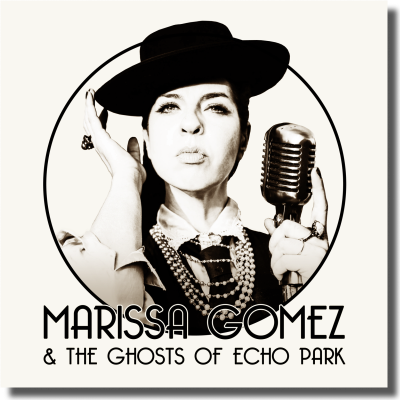 Singer/songwriter Marissa Gomez and The Ghosts of Echo Park have been captivating Los Angeles audiences with their infectious brand of bawdy blues and saloon-style jazz for nearly a decade. Anxious to share her music with the world, Marissa joined forces with Grammy-nominated producer/engineer, Dennis Moody, and a lineup of Los Angeles’s finest musicians to record The Ghosts of Echo Park’s self-titled debut album. Growing up on the east coast, Marissa witnessed as her father, famed Flamenco singer Luis Vargas, seduced audiences with his deep, soulful voice, and songs of passion for their bread and butter. Never thinking she would follow in his footsteps, it wasn’t until sudden tragedy struck in 1999 that she would turn to music to cope with her grief. In need of a release from the ghosts that haunted her, her band The Ghosts of Echo park was born. Up close and personal, Marissa serves up saucy vocals with attitude and charming vulnerability, documenting torrid tales of love, lust, and loss. Told through toe-tapping humor, and catchy hooks, the music will have you singing along, long after the music stops! FREE song download with sign up!